May 21-23, 2019 - Great Wolf Lodge Concord, NC! Join us in Concord as we celebrate 25 years of Safe Kids in North Carolina! 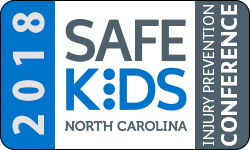 The Safe Kids NC conference provides attendees the opportunity to learn about the latest in injury prevention research, analyze data and trends, learn tips on how to operate safety programs on any budget, and obtain ideas for coalition and program management. This conference is an exciting opportunity to meet and network with other specialists in the field of injury prevention. There will be presentations by injury prevention coordinators and industry specialists on various risk areas & emerging trends, communication & fundraising strategies, community organization, and much more! This year’s conference will give attendees the chance to gain professional development as they network with peers, earn CEU’s for child passenger safety recertification, and enjoy the new and exciting workshops being offered! Attendees of the conference will have the opportunity to earn six CEU’s for child passenger safety recertification. This is an excellent opportunity to learn about new trends in child passenger safety and learn from other child passenger safety professionals.